CHAKO is always looking for new ways to develop. If you think you can support us in any way, please contact us. You can make the difference! By supporting CHAKO you contribute to social development environmental protection in Africa. 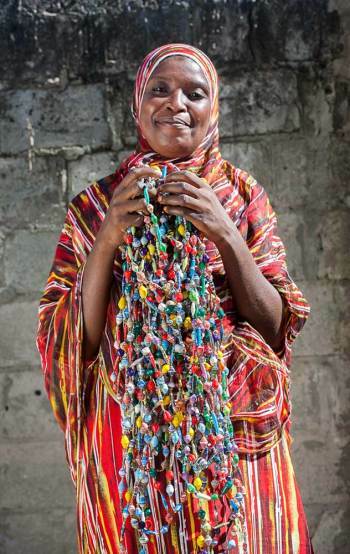 You create a sustainable income for our local artisans and stimulate the local economy in Zanzibar. You forster upcycling of tourists’ waste in Zanzibar that CHAKO transforms in beautiful products. This is really good for the environment. New opportunities for innovation. We can use new methods to make our products. You stimulate the creation of new accessories and interior design lines. Our partner organisation Zenji Treasures in The Netherlands has an ANBI status. When you donate to CHAKO, you can deduct your donation from your taxes (if you live in The Netherlands). Contact us for more details. CHAKO collects bottles already at several resorts and boutiques in Zanzibar. But we are still looking for new locations. Have you got empty bottles and you like our philosophy, please contact us. CHAKO is supported by the following sponsors. Zenji Zanzibar Foundation is the overall name for the projects and initiatives that promote, protect and develop the tourism industry of Zanzibar with the aim to improve the life of the local people. Zenji Zanzibar believes in the strength of people to take their lives in their own hands to create a better future. Their aim is to create direct and indirect income for the rural local community by stimulating local entrepreneurship, encouraging tourists to participate in local tours and buying locally produced gifts. All local staff and entrepreneurs receive training on the job. Zenji Zanzibar works together with local organizations, NGO’s, private companies, educational institutions and enthusiastic and motivated persons. It is a 100% locally owned organization.